Recently I have been enjoying the joys of kinetic art. 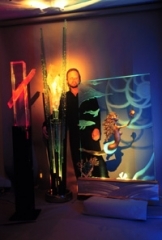 Through the use of special art and high-tech glass, I create subtle kinetics through the interactions with light-‘kinetic light’. The wide variety of sizes and materials is evident in his works of art. Some of the images are created through a mutual synthesis of his clients’ suggestions and desires manifested through his style and creativity. Copyright ©2011 Montagne Studios. All rights reserved.